We love to entertain. But the truth is, having friends over is a lot of work. All the planning, the food preparation, the setting up of your place, and then, of course, the cleaning up can be quite stressful, but that shouldn't really hold us back from having a get-together. Clean only what the guests will see. Not that we're encouraging you to put all your things in the closet or under your bed. What we're trying to say is that you need not waste time cleaning every corner of your place before your guests arrive. Keep in mind to keep your house clean enough for you and your friends to be comfortable. Make sure the bathroom and the kitchen are clean, the floors are swept, and the living room and dining room de-cluttered. Have your food ready ahead of time. Your friends have arrived, they've made themselves at home, and have been catching up on how they have been doing. Meanwhile, you're in the kitchen still cooking the food while your friends are having fun. Prepare dishes that you can make ahead of time or those that doesn't take a lot of time cooking. How about making Pasta Four Ways, Pineapple Korean Beef Stew, and Fiesta Merengue Layers for the dinner spread? This way, when the day of the get-together arrives, you'll spend a minimal amount of time in the kitchen and more time with your friends. Need other suggestions for easy make-ahead recipes? Check out our Kitchenomics database for more. 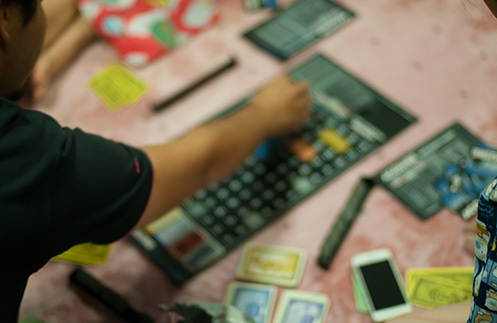 Have your friends bring their favorite board game for a night of healthy and fun competition. Monopoly, Cluedo, Boggle, Battleship, Game of Life — the list goes on! If there aren't any board games available, that's ok. You and your friends can team up into two groups and play Celebrities, Password, Never Have I Ever, or Charades. All you need is a pen and paper for these. The most important thing to do when you're entertaining friends is to remember that it's supposed to be fun. Don't stress yourself over the perfect menu or worry too much about how everything looks like. Just let loose and have fun. That's why you invited your friends over in the first place, right? This weekend, try not to make entertaining a chore. Apply these tips to make the get-together even better without taking on any added stress.